When you’ve invested energy and money into your home, you want to make sure it stays in great condition for as long as possible That’s why one of the most disheartening things that can happen is to get a stain or a burn on your carpet. However, just because your carpet has had an accident doesn’t mean you need to replace it. You may be able to fix up or repair carpets damaged section. Who likes damaged and stained carpets. Imagine your beautifully walled home with a chandelier hanging above and you a mud red coloured smudge laying on your carpet. What kind of impression are you leaving on your guests? You do not want your neighbours talking about your hygiene standards. We understand that carpet stains are stubborn, you can hire a carpet stain cleaning professional for the same or use the below given tips if you have enough time and energy at hand. 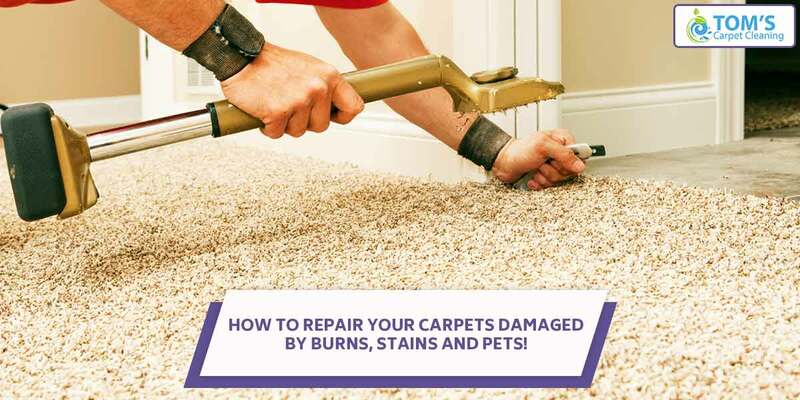 How To Carry Out Carpet Burn Repairs? You need a pair of scissors for the same or even a nail clipper would do. Cautiously trim the stained threads off the carpet. Don’t cut too much or too deep into the carpet to ruin the entire carpet. If the mark is deeper, and you need to cut all the way down. You might need some carpet fibres to replace the bald patch. You will have to stick a little bunch of fibres to the base of the carpet using a toothpick. Slowly and put a drop of a colourless waterproof adhesive on the base of each little bundle fibre, then attach it to the carpet backing. You might end up with a bunch of glued together carpet lumps, but that’s a bargain you’ll have to make. How To Repair Carpets Damaged? Did you drag your furniture on your carpet? Has that left a patch on your carpet? Here is what you can probably do. You can simply revive the carpet with the help of a spray bottle, water and a hairdryer. Spray water all over the damaged area and dampen the crushed fibres. Make sure you do not soak them. Now dry them with the hairdryer and then brush them up with your hand, you will see considerable change. If cleaning with soap and water, or dampening and drying after not working out then you may simply have to replace the patch of the carpet. Or is this the case of repair carpets damaged after by pet . For that, you will have to keep in mind that all carpet has a grain or texture as depending on how it is manufactured. What To Look At The Time Of Carpet Repair? You will have to brush it one way the fibres stand up, and brush it the other way the fibres seem to lay down so that you get the coherence between the patched up piece and the rest of the carpet. Also, make sure that any replacement piece used is positioned so as to make the grain running the same way as the rest of the carpet. According to experts suggest that replacement pieces are less noticeable if they have been cut in triangular or circular shapes. Squares and rectangles somehow stand out and give away. Call us on 1300 068 194, to get carpet repair-melbourne, carpet repair-ringwood and other carpet repair services across melbourne.